Nicholas Rowe once said, "guilt is the source of sorrows, the avenging friend that follows us behind with whips and stings." Arrow is no stranger to the topic of guilt. In fact, they even once had an episode titled "Guilt" (that's cutting out the middleman in terms of theme right there, folks). But this episode, you'll notice, isn't titled that. Instead, it's titled "Penance." I think that most of us understand the concept of penance, and what's extremely important in this episode is that we encounter a few of the characters paying the price for the guilt they feel. You see, guilt is different from penance. While guilt is a feeling, penance is taking action on that feeling. We know from last week's episode that Felicity feels guilt for the death of Rory's family and for what happened in Havenrock. And Diggle feels guilt for what he did to Andy. If the feelings stopped there, that would be it. But Felicity and Diggle end up punishing themselves in this episode in order to try and assuage the feelings within themselves. Luckily, the two have partners who are able to pull them out of that guilt and penance and bring them on a path toward healing. Before we get started with this review, you'll notice it's later than usual, and that's because... I really don't have much to say about "Penance." While there were some good moments, the episode ultimately left me more confused than ever as to what this season is trying to accomplish (and no, writers, just by having Felicity say "legacy," you cannot justify your theme). It felt like yet another filler episode and I suppose if the show wants to get the fillers out of the way early in the season, that leaves more time for important episodes later on. Still, I found it really difficult to stay engaged in the episode. Additionally, I'm kind of confused as to what lessons Oliver is supposed to learn this year. Literally the lesson this week for him was: "Go against your friend's wishes because you know better than they do, and it'll all work out." That's exactly what Oliver and Lyla did. I know they were saving Diggle from himself, but also they were directly contradicting what he wanted. It's a fine line because Diggle's health and sanity and character growth were on the line, but also I'm kind of disappointed that the show literally told us that Oliver will just keep doing things for people because he knows best and instead of having any issues, it'll all be peachy in the end. Even this week's Bratva flashbacks bored me, but for the sake of parallelism, they also took place in prison. As we knew from the end of last week's episode, Diggle wanted to keep himself locked away so that he could pay for what he did to Andy. Oliver and Lyla won't have it, while Felicity refuses to participate in the prison break because she doesn't agree with the fact that Oliver is making choices on behalf of others yet again. I can't say that I blame her, and I'm really glad that we got to see a little bit of a snappier, biting Felicity this episode. It's easy for Arrow to ignore what has happened in the past (that is often their method of operation), but I'm happy that we had the chance for Felicity to remind Oliver that he has issues with letting other people do things he doesn't agree with. Oliver is, at his worst, rife with potential to be a toxic male character. His experiences and his growth as a person are what keep him from backsliding into that person. And I'm extremely thankful the show had Felicity point out how absurd what he was doing was and not support the mission by helping. That shows healthy progress on Felicity's end. Go girl! 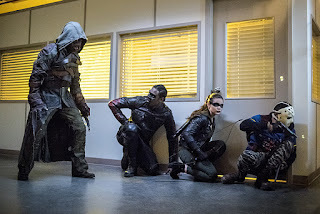 Oliver and Lyla eventually break into prison, get Diggle out (in the most unbelievable sequence ever), but not without a bit of a fight from Diggle. He tells Oliver that he has to stay in prison and suffer because it's what he deserves after killing Andy. Oliver's brilliant theory is that Diggle doesn't deserve to be in prison for the things he's accused of, and if he wants to pay penance for Andy's death so badly, he can do it as Spartan. I'm not going to lie: this was the most baffling logic. But then again, Arrow is not a show known for its iron-clad reasoning, I suppose. Diggle is appreciative that his friend wants to pull him back from such a dark place, and I'm glad Oliver is too. But then Oliver muses that he probably hasn't changed and — at the end of the episode — Diggle tells him that he hasn't changed, and that's a good thing. I don't even know what else to say about this storyline because I love Diggle, I really do. I just feel like the show has really rushed the arcs of both him and Felicity in order to get to more plot and stories this season. Arrow knows it already has too much to juggle — focusing on the new recruits, allotting time for Oliver as mayor, Bratva flashbacks, more crossovers, tying up loose ends from last season, and giving screentime to the bad guys — and unfortunately what seemed to get cut already this year are the dangling threads from last season. I was really hoping we would get a chance to see Diggle really process what happened, or that we would at least see him more in action. Sadly, I feel like Arrow has already mostly shut the door on this story for Diggle. Even though it might be touched upon in the next few episodes, it won't be a focus and that's unfortunate because David Ramsey deserves to shine in a storyline all his own. So let's briefly talk about the other character whose story from last season gets pretty quickly wrapped up: Felicity. What I will say right off the bat is how irked I am by the fact that Felicity's story — this huge, guilt-inducing, life-altering story — not only got brushed aside as a "moral of the week," but that it was used in order to prop up a new male character. Felicity couldn't even have her own story about guilt; it had to be shared with Rory. And in some ways, I guess I can sort of understand why the two are paired up: they're both suffering from the same event, but in different ways. I did enjoy the end of the episode because it established the fact that people who are feeling guilt need other people to hold them accountable. We can't navigate our guilt by ourselves because when we try, we drown. The problem, of course, arises not from the fact that Felicity needs to lean on someone during this time but that her guilt is not her own. It is used to prop up Rory's tragedy, and HIS story of his father ends up becoming the focus, not Felicity's. If you doubt that, think about what Felicity did toward the end of the episode — she researched Rory's father and learned about his life and his sacrifices. In the end, Felicity's potentially interesting and dark arc (one of the first that she's had apart from a storyline with Oliver) is reduced to a plot point in a male character's story. Again, this doesn't mean that Arrow can't bring elements of Felicity's guilt back into the fold. But as far as the meat of the story is concerned, it seems like we're finished with Havenrock. Felicity and Rory spent most of the episode at odds, but then made up and agreed to hold each other accountable if they ever begin to sink into guilt or despair. I don't understand how this story could be so quickly covered and then concluded. Heck, we devoted the entire back half of last season to Oliver and Felicity's romantic drama, but we can't even devote twenty minutes over the course of two episodes to the fact that Felicity was forced to take thousands of lives in order to save others? Honestly, I don't have much more to say about this week's episode in terms of plot or characterization. It was fun to watch the newbies spring into action, but Oliver's decision to knock them out instead of letting them help him or even talk to him was absurd. Every week, we seem to get a story involving how Oliver knows the way he's leading is wrong and admits he needs help correcting his ways; then we get episodes like "Penance" where a character who used to serve as this show's moral compass tells Oliver he SHOULDN'T change and is, in fact, glad that he's as stubborn and controlling as ever. And to top it all off, the two leading women left on the series are relegated to B- and C-plots on the regular. I guess I just expect a little more from Arrow at this point. "Penance" wasn't a terrible episode by the show's standards, and it definitely wasn't rage-inducing like a lot of season three and four were. However, it just wasn't interesting. It took too little time focusing on the characters and much more time setting up ACU stories, prison breaks, and Wild Dog's capture. Nothing in the episode feels really earned, and that's the biggest problem of all. Because when nothing in an episode feels earned, what's the point? I love the codename "Artemis," but I still prefer to call her "Baby Canary." One thing that was definitely on-point in this episode and I need a lot more of? Quentin Lance's sass. He was back to his old self and it was so glorious. "Please make sure no one destroys the city while I'm away." "And if you were thinking about lying, I do admire your consistency." SHE WENT THERE AND GOD BLESS, IT WAS GLORIOUS. "Oliver forfeited his opinion when he left town." SHE WENT THERE AGAIN AND GOD BLESS, IT WAS EVEN MORE GLORIOUS. "You scared?" "No, but I'm not stupid either." I don't know why Felicity couldn't send the baby Team Arrow into the field with someone like Thea watching their backs at least. It seems like that would have been the smartest move, but okay. "Was he... waiting for an entrance line?" Rory, hilariously meta and also just hilarious. What did you all think of "Penance"? Sound off in the comments below! Are you talking about the moment she said that Oliver forfeited his opinion when he left town? I thought that essentially was similar to what the team said after Oliver went to "die" on the mountain in season three, then came back and tried to boss everyone around. The team told him, essentially, that since he wasn't there while they were out in the streets, he had no right to tell them how to be a team or what to do. I think that Oliver's intentions were good but again, Felicity makes great points in the fact that he's doing a LOT of stupid and illegal things AND going against Diggle's wishes... all behind his back. That storyline was basically Oliver and Lyla saying, "No, I don't accept this situation so I'm going to forcefully change it, whether Dig wants me to or not." I'm teetering on the edge of how I feel about that. On the one hand, they did save Diggle from forcing himself to remain in prison for a crime he didn't commit; on the other, though, they invalidated his guilt by telling him that "this is not the way you feel guilty." Anyway, all of that rambling to say that I'm not totally on board with how Oliver handled the Diggle situation, and I can understand why Felicity chose to not be a part of the mission -- if Oliver continues to want to do something she feels is stupid even after she tells him how he feels, then she doesn't have to be a part of it. Hmm, well it's taken me awhile to both see the episode and formulate my thoughts about it. My first thought is that a show about a vigilante is going to have a difficult time making a consistent argument about who should and should not go to prison and how people should be punished. By its very nature, a vigilante premise means that it is arguable that the current justice system is not doing its job and that we can, at least partially, root for a character who could arguable be charged with multiple counts of murder him/herself. It's always going to be messy talking about justice on Arrow. I can understand Lyla's point of view. There are multiple problems with Dig taking the fall in order to punish himself. One, she clearly saw him being slightly out of it when he showed that he was seeing and talking to dead man in his cell. This does not bode well for his state of mind. I do believe that if people are mentally ill it is justifiable to prevent them from hurting themselves. And you made a good point about not believing your own thoughts all the time. John's argument about being punished is very shaky and based more in his feelings of self-hatred than reason. Yup, Dig did not have to kill his brother. He was not doing it in self-defense in the sense that Andy was not, at that moment, on the verge of harming him. But boy was he making sure the threat was understood. (Not that that counts as ground for self-defense) Andy took great satisfaction in seeing his brother suffer and do things he was ashamed of. Andy was susceptible to HIVE because he already believe that the world was a horrible place and that people are basically awful. Spending years working for Darhk only deepened that twisted mind set. He relished seeing Dig beat him up for information because he knew it not only hurt his brother do it but because it proved that even his morally upright, goody -two-shoes, preachy brother was really just violent and horrible underneath. It proved his world view and he took joy in bringing Dig down. He relished threatening his brother's family because he wanted to push Dig to be as violent as he was. He was surprised that Dig actually did it which was sadly touching. However, he put himself in the same category as Dhark, R'as or lots of other characters that Oliver killed even thought his life was not immediately threatened. And Diggle never expressed any feeling that Oliver should be punished for those deaths. It is the fact that Andy is his brother that makes it so much worse. However, doesn’t that fact also make what Andy was doing equally worse that R’as al Ghul or Damian Darhk? Andy took glee in terrorizing his own family. Yikes. I’m not saying that justifies Dig’s actions in killing Andy; I’m just saying Diggle is using a different set of standards for himself than he uses for Oliver so justifying his own imprisonment that way seems unreasonable. You mentioned that Lyla and Oliver were not doing the right thing by basically telling Diggle how to process his own guilt. Well, we are justified in telling the people we love that they are hurting themselves. There are terribly self-destructive acts that people engage in in order to passify their painful feelings. But we don’t have to let them. Diggle and Felicity (and the entire Arrow audience) have had no compunction in telling Oliver when he is being a self-destructive idiot. People have had to tell both Laurel and her father much the same thing in regards to their addiction. And the list could go on and on. Now, this is not to say that Felicity is not correct to raise lots of problems with their plan. They clearly were going to ask her to help. She raises very good points about felonies, a fugitive life, and John’s desire to stay in prison. I do think that her argument here is deeply coloured by her own desire to be punished for her actions to do with Havenrock. She is projecting her desire to suffer and not be saved on to John, or at least seeing them as equal in that right. Although, in the past she has never been on board with either Oliver or Roy going to prison for even their own reasons. She and Oliver are not disagreeing just about John (although they have very different viewpoints on that front). They are rehashing the past between them. We all do this. All our relationships are coloured by past interactions. And bringing up Oliver’s habit of lying or making decisions for others entirely connected to sore spots between them. It’s just that cloaking past fights under a new one doesn’t entirely deal with the problem. Pretty typical of long-term relationships though. And the advice to not bring up the past every time you have an argument is also ALWAYS good advice. Our fights will be fairer and better and more productive if we can stop bringing up old arguments and blame. It’s just so hard to do! What I find more interesting about Felicity’s critique of Oliver (one we can all see the merits of) is that she herself has justified that exact same behaviour in her own life. When she disagreed with Oliver’s decision to leave Starling City after season 1, she and Dig went after him. I don’t think that crosses a line. However, she disagreed with Oliver’s decision to join the League of Assassins she went further in taking someone’s agency away than almost anyone else in the show. She DRUGGED his drink and tried to drag him out unconscious. (Oliver did not show one grain of anger about that.) I’m not beating her up for that decision. I just find it interesting. I am always intrigued when characters are pushed to a point where they make a decision that goes in the face of past behaviour. It is very revealing seeing at which point we are willing to compromise our values to get a certain result we care about very deeply. Anyway, I just want to point out that Felicity is not entirely free of the very behaviour she is criticizing and that is just so human. She takes a dig at Oliver for lying to her while she is lying to her current boyfriend on a regular basis. She is angry at Oliver for making decisions for others when she has been pushed to the same point herself. Their disagreements in the episode are deeply layered and I find that interesting to watch. The conflict between the team and Oliver about the lack of communication was well placed I thought. Them trying to stop Oliver from doing something stupid which he was convinced of while Oliver is trying to stop Diggle from doing something stupid which he was convinced of was a nice juxtaposition. Felicity disagreed with Oliver’s decision so tried to stop it by sending the team. The team believes they have some rights to affect Oliver’s agency due to the team dynamic, rights to communication and Oliver thinking how his decisions will affect them. Oliver believes that due to his relationship with John (“You are my brother”) he has the right to try and stop him as well. Lyla believes that she and John are in it together now that they are married and that she has the right to stop him from giving up and leaving his family due to his self-loathing. It’s a super complicated issue and one the show does not try to solve. It’s touching and I truly believe that Oliver is ready to face whatever Diggle faces. It’s also very manipulative because of course Diggle does not want to see Oliver in federal prison with him. But I also think it gets at something deeper. It subtly reminded me that Oliver “deserves” to be in prison just as much, if not more so, than John Diggle. Let’s not forget Oliver’s body count. And it is something that Diggle defends when Felicity asks him about that in season 1. Lots of the killing that Oliver did back on the Island or in Hong Kong was due to self-defense, fighting to survive, or being forced by Waller. Russia is a whole different ball game. He is there willingly. He joins the Bratva willingly. And let’s not romanticize the Bratva no matter how much we like Anatoly and all his speeches about brotherhood. They are organized crime with fingers in everything from drugs, to weapons, to cyber crime to human trafficking. These are not nice guys. And we watched Oliver kill his kidnappers to protect his secret in the pilot. Clearly he’s going to get a lot darker while in Russia and Diggle has never hinted that Oliver should be punished for any of that (although he seemed to consider it when Roy killed while under the influence). If Diggle believes he should be in prison for what he did then surely Oliver deserves to be there too. Getting out doesn’t mean they don’t have guilt or need to make reparations, it just means that he can see a way forward for himself like he has always believed there is one for Oliver. Oliver standing with him in that cell communicated that beautifully I thought. I don’t share your concerns about Felicity’s story propping up Rory’s. Those two are forever linked by Havenrock. No matter what happens, they are forever going to be in each other’s thoughts and actions. Felicity’s actions will forever connect her to the people of Havenrock and Rory is the last one alive that she can talk to. Working together will be incredibly painful and possibly deeply healing. Looking up the story of Rory’s family is a good bit of homework for Felicity. It would be recommended by a therapist I believe. The people of that city were not just a casualty count, not just numbers on a screen. Coming to know Rory and his family makes them very real. And that is even more painful. But it only through confronting the depth of the horror than Felicity can move past it. The writers gave her a living, breathing person to interact with in her path to move forward, one that is not Oliver, has little to do with Team Arrow, one that part of her demon alone. No one else can feel what Havenrock really means to them. So I don’t particularly care whether that story of Havenrock is embodied in a man, woman, or child. It is a way to show and not tell about moving on from tragedy. And I have never been more proud of Felicity than in that scene with Rory. I just like their dynamic. But she is self-aware enough to know that she needs to do something to move on. She’s had Curtis and Oliver recommending she face her fears and talk to Rory. She is the “Oliver” in this storyline. Others are giving her good advice so that she is not stuck in shame. Unlike Oliver, she pretty quickly listens to that advice and does one of the most healthy things anyone in this show has done in dealing with trauma. She talks to Rory with compassion and understanding and vulnerability. The camera did show Rory’s face more in the scene. We’ve watched Felicity’s reaction to Rory in previous episodes. Rory has only recently discovered their painful connection so it seems fair to show him trying to come to grips with it. - Oliver making threats to the target’s wife and child in the flashback was pretty creepy. He very calmly said the man had to make a choice. Ouch. And then the cold blooded killing of said man. Yup, he’s getting way darker than anything we’ve seen since the beginning of season 1. - The Wild Dog/Rene character is getting on my nerves. I can live with the recklessness more than the distainful way that he treats everyone on his team. He seemed particularly dismissive of the women in this episode. He took Artemis’ shot, he dismissed Felicity as “Blondie”, and he snipped at Thea. This guy never seems to learn and he’s quite mean. Oliver is a stubborn jerk sometimes but he has never been so sneering. - I’m liking Felicity in the commander role (who asks for votes) making yet more painful decisions. She will not be able to escape making them and I think she is holding up remarkably well. - I am liking Tobias Church as a villain. He is a little funny, super creepy, very gritty and smart. But not all powerful. I think the episode did a fairly good job at keeping him in the mix while having the Diggle breakout story as well. - It was good to see team dynamics without Oliver. Rene needs to be less irritating, Artemis is smart and I think could be interesting if they gave her more to do, Rory is my fav of the newbies and I’m glad that Curtis’ development as a vigilante continues to be realistic.